By the end of this week, the House will have held more than a dozen hearings focused on climate change. The House Science Committee’s first hearing on the subject under its new Democratic leadership showcased a different dynamic from ones in recent Congresses, with little dissension over climate science and both parties calling for investment in clean energy technology. 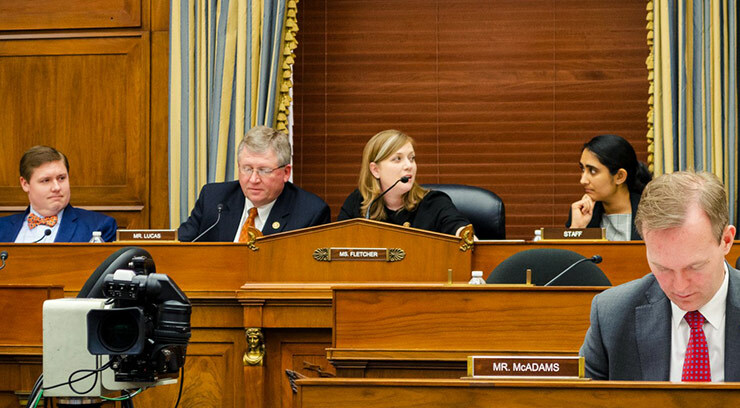 At center, House Science Committee Ranking Member Frank Lucas (R-OK) and Environment Subcommittee Chair Lizzie Fletcher (D-TX) at the committee’s Feb. 13 hearing on climate science. The House Science Committee held its first of a promised series of hearings on climate change on Feb. 13, with a second, dedicated to its impacts on oceans and coasts, scheduled for Wednesday. The first hearing departed significantly in tone from ones held under the committee’s former Republican leadership, which were often punctuated by contentious exchanges about the validity of the scientific consensus on drivers and impacts of climate change. While there were still disagreements at this latest hearing, they remained comparatively mild and divisions within parties were sometimes as evident as the divisions between them. In prior years, Science Committee Democrats criticized Republicans for holding hearings on climate change that were stacked with witnesses expressing views at odds with consensus positions. Now, for the first time in more than eight years, they were able to invite the majority of speakers. They were: Natalie Mahowald, faculty director at Cornell University’s Atkinson Center for a Sustainable Future; Robert Kopp, director of Rutgers University’s Institute of Earth, Ocean, and Atmospheric Sciences; Jennifer Francis, a senior scientist at Woods Hole Research Center; and Kristie Ebi, director of the University of Washington’s Center for Health and the Global Environment. The Republicans invited Joseph Majkut, director of climate policy at the Niskanen Center, a think tank that frames itself as “animated by a spirit of thoughtful moderation.” Called on often over the course of the hearing, he endorsed mainstream positions on climate science while backing mitigation policies based on innovation and incentives that are conscious of costs and market demands. Though this administration has regrettably chosen to ignore the findings of its own scientists in regards to climate change, we as lawmakers have a responsibility to protect the public’s interest. As any farmer can tell you, we are especially dependent on the weather. Droughts and heat waves come and go naturally, but the changing climate has intensified their impacts. We know the climate is changing and that global industrial activity has played a role in this phenomenon. Observing that his views are informed by Oklahoma’s experience with the “prolonged environmental disaster” of the 1930s Dust Bowl drought, Lucas advocated for research to better understand the influence of climate change on weather patterns, to increase preparedness, and to develop new energy technologies. Not all of the committee’s Republicans followed Lucas’ lead. Two longstanding committee members, Reps. Brian Babin (R-TX) and Mo Brooks (R-AL), sought to draw attention to the natural variability of the Earth’s climate and suggested a warming climate could prove advantageous. Majkut pushed back on this notion, saying, “It is not that there is an ideal temperature that we know, for certain, that human flourishing will be maximal. Science can’t really tell us that in a meaningful way. What we do know is we’ve built our society around the temperatures that we encountered over the last 200, 300 years.” He then observed, in accord with a point Ebi made moments before, that anticipated temperature changes will be much greater than those experienced in recent centuries. Some newer Republican committee members articulated a desire to confront climate change. In particular, Rep. Michael Waltz (R-FL) began his questions by noting he represents a coastal district and that “seas are rising.” He also pointed to his experience as an Army officer, saying, “I’ve spent a lot of time in Africa, the Lake Chad Basin, where we’re dealing with the destabilizing effects in Nigeria and Niger.” He asked the witnesses about what energy R&D areas could benefit from additional investment. Several Democratic committee members focused their attention on different climate change impacts. Environment Subcommittee Chair Lizzie Fletcher (D-TX) noted she is one of several committee members representing districts along the Gulf Coast of Texas and pointed to the damage caused by rainfall during Hurricane Harvey in 2017. Reps. Suzanne Bonamici (D-OR) and Ben McAdams (D-UT) expressed concerns about the impacts of air quality on health. Rep. Sean Casten (D-IL) asked about the frequency of extremely hot and cold weather. While the hearing was intended as an examination of climate science, much of the conversation turned to policy options for mitigating climate change. Some Republican members criticized proposals to move quickly away from fossil fuels, saying they would unacceptably raise the costs of energy. Meanwhile, two Democrats, Reps. Ami Bera (D-CA) and Steve Cohen (D-TN), praised the Green New Deal concept as an expression of “aspirational” goals for climate policy. There was, though, broad bipartisan agreement about the importance of energy innovation. Committee members spoke repeatedly about potential technology areas for investment and models for fostering partnerships between government and industry. Rep. Dan Lipinski (D-IL), for instance, said he would like to increase funding for the Advanced Research Projects Agency–Energy. The Science Committee is dedicating a separate hearing to ARPA–E tomorrow. Going forward, the committee will be one of several focal points for discussion about climate science and climate policy in the House. The newly formed Select Committee on the Climate Crisis has yet to convene but work in other committees is already well underway. The Energy and Commerce Committee held its first hearing earlier this month and is holding another on the Paris Agreement this week. The Natural Resources Committee has already held six hearings on climate, and has another scheduled for tomorrow. * The Appropriations and Transportation and Infrastructure Committees are also adding their voices to the chorus this week. While climate has not been an explicit focus in the Republican-controlled Senate, energy innovation has become an active subject there as well. The Senate Energy and Natural Resources Committee held a hearing on the matter earlier this month, and the Environment and Public Works Committee is meeting this week to consider a bipartisan bill that aims to boost technologies to capture and reuse carbon dioxide emissions. *Correction: This article originally stated there would be a total of 12 hearings on climate change, including five by the House Natural Resources Committee.